Fixed-blade knives are a popular knife choice that come in a variety of styles. Their diversity of application and ease of use make them a smart choice for beginners and veterans alike. Fixed-blade knives feature a solid construction, where the blade is permanently affixed to the handle in one position. Fixed-blade knives will never run the risk of not opening properly, like switchblades, and are ready to use once pulled from their sheath. This buying guide is for those who are looking to buy fixed-blade knives. It includes information on the different uses and types of fixed blade knives, as well as the materials used to make them. There is also a section about how to buy fixed-blade knives on eBay. Hunting and outdoor knives are one of the most common types of fixed-blade knives. Hunting and outdoor knives are used by hunters, fishermen, and nature lovers alike. This sub-category encompasses boning knives, fillet knives, and standard hunting knives, and are sometimes outfitted with gutting hooks. Hunting and outdoor knives come in a great variety of shapes and sizes to accommodate the preferences of outdoorsmen. Tactical knives are generally sleek and straight knives, that are often built and finished with subtly in mind. They are generally used in survival and self-defense circumstances. Tactical knives are viewed as a generally multipurpose knife. 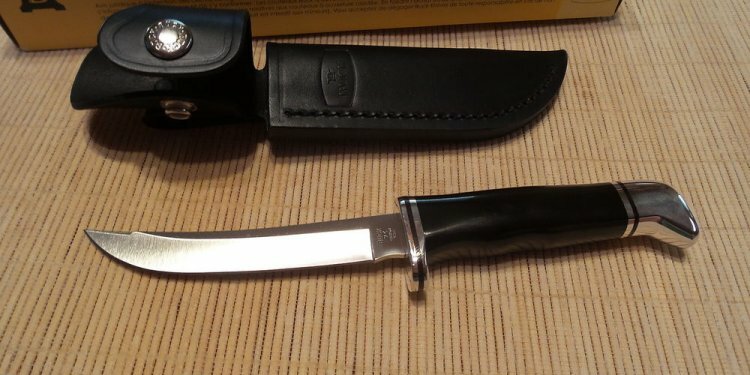 The Bowie knife is a classic American knife that has been in existence for over 100 years. Bowie knives feature a more sizable blade and are built for heavy duty use on a regular basis. Bowie knives are work knives that are good cutting devices, for sticks and twigs, and can also be used in hunting situations. Throwing knives are specifically shaped and sized for target throwing, hunting, or self defense. They are generally made of solid steel to accommodate impacting solid surfaces at high speeds. Throwing knives feature a thin, tapered metal handle that allows for a clean release from the hand when thrown. Neck and boot knives are a subcategory of fixed-blade knife meant for concealment. These knives are generally smaller and have unique handles outfitted with rings or palm handles. Kitchen knives sometimes fall into their own category, but are also a prime example of the most common fixed-blade knife. Kitchen knives are made in a variety of shapes and sizes, and are made of a variety of materials, to accommodate a multitude of uses.